Spc. Micah S. Gifford. 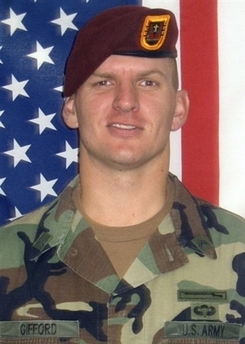 Gifford, 27, from Redding, CA was killed by a roadside bomb in Iraq. Micah works odd jobs in Redding, CA and originally intended to become a firefighter, however he saw the terrorist beheading the American Contractor Nicholas Berg and told his mother that "it didn't feel right to sit at home while that was going on"
"Don't pray that I come home soon," Gifford wrote to friends on his MySpace.com page shortly after his Army unit was deployed in Iraq. "Pray that the people that are causing us to stay out there can see the light and change their ways without harm coming to them first." Then, in character, the 27-year-old preacher's son with a prankster's heart outlined the retribution he could deliver: "All I gotta do is flex and their brains will explode out of sheer amazement, so again ... don't worry about me." Gifford had not originally planned to go into the military. Born in San Diego, he spent his teenage years in Torrance when his father, Dale, was the minister of Hermosa Beach Church of Christ. Gifford then attended Harding University, a Christian college in Searcy, Arkansas. CPL Gifford is posthumously awarded the Bronze Star Medal, the Purple Heart Medal, and the Combat Infantryman Badge.